There are specific solutions to hearing loss: diagnosis, properly fitted hearing aids when needed, and improving listening and communication skills. What are typical signs of a Hearing Loss? Difficulty with conversations, especially in noisy places. Turning the volume of the TV too loud for others. What is the first step in treatment of a hearing problem? 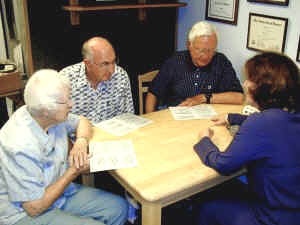 A comprehensive hearing evaluation by a certified audiologist. If there is a permanent hearing loss, what can be-done to help? A properly fitted hearing aid can amplify weak and distorted sounds to improve hearing ability. A hearing aid may fit in the ear, or, behind the ear. The best hearing aids are digitally programmable units, which are individually adjusted for optimum speech understanding. Why go to an audiologist for hearing aids? An audiologist has graduate university degrees and national certification. Uses advanced, computerized measurement procedures. Dispenses the majority of hearing aids. Is dedicated to overcoming hearing loss through education and follow-up care. Call Michele Wilson, Ph.D., for an appointment at 949-857-6051.